We had come to Costa Rica for the sites, to see the rain forest and a volcano, and to ride the zip lines -- of course, all that. But most of all, we had come to see monkeys. And six days into our trip, we had seen scarce signs of them-- the dark shadows of one or two howler monkeys mocking us from the canopy during our horseback ride at Arenal. 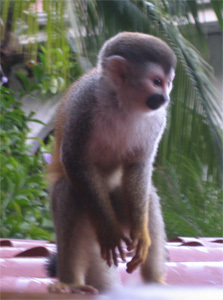 Then, on our first morning down near Manuel Antonio Park, we woke to the sound of something thumping on our hotel room roof. At home, it might have been squirrels, but I thought I could hear soft rustling just behind each louder sound -- maybe a long tail? 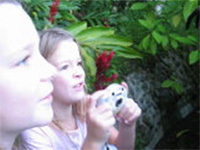 Jen was out first, and as she went up to the pool deck was pleased to see a monkey and then another in the trees. Then she turned around to see the roof -- where two or three dozen of them were frolicking. 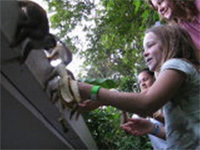 You're not supposed to feed them; we know that now, because our Lonely Planet guide berated us about it. 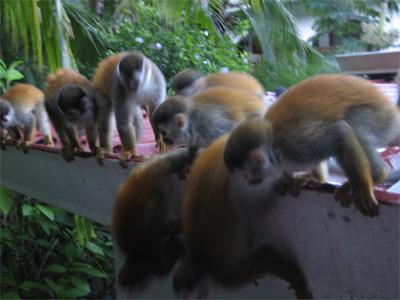 But that hardly occurred to us as our hotel clerk handed bananas to the girls, and as the capuccin monkeys grabbed the offered chunks with their soft little monkey hands. This Old Tyme newsreel tells the whole story.